Confidence in yourself and your abilities is imperative to your success. But, confidence is one of those things that can disappear as quickly as it appeared. One minute you can feel on top of the world, and then an off-handed remark by a co-worker, family member or even a complete stranger can send your confidence into a tailspin! 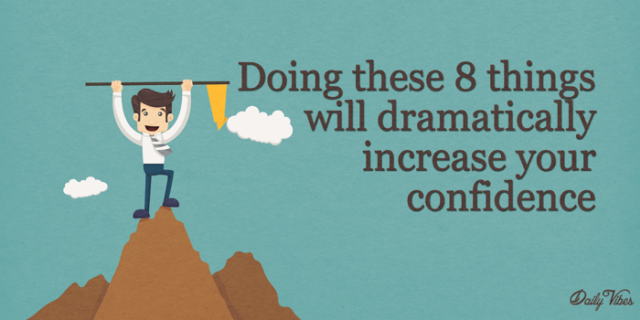 Luckily, there are things that you can do to boost your confidence. And, since confidence can truly make all the difference, it’s important to have a few simple methods under your belt that will raise your confidence levels to amazing degrees. Below, I’ve listed 8 things you can do to be more confident. Chances are, if you ask 10 people what their opinion of you is, you’re likely to get 10 totally different answers. While it’s okay to listen to what other people have to say about you, that doesn’t necessarily mean you should take it to heart. You can’t control what other people think, so it’s important that you have confidence in who you are. Find a style that makes you feel great and live the life that you feel is right for you. Humans are flawed creatures. So, as a human being, it is impossible to be perfect. We ALL make mistakes. If you constantly strive for perfection, you will only create self-doubt. Making mistakes is what helps us grow. So, next time you make a mistake, don’t be hard on yourself. Think about it, learn from it, and then move on. Focusing on the worst possible outcome can cause you unnecessary anxiety and stop you from taking action. Use your energy to acknowledge that there are an endless number of outcomes. What you think is what you become. Visualize the results you want and they are likely to happen. When you see proof of the accomplishments you’ve made, it keeps you moving forward to accomplish even greater goals. Hang those certificates of achievement and awards in your cubicle or office. Make a list of your fabulous qualities and keep the list close at hand to revisit when you’re feeling less than confident. Fear is normal. The key is to not let it debilitate you. Recognizing your fears will not make them come true. It’s best to acknowledge and address the fears rather than not face them at all. Write out what you’re afraid of and what you will do to mitigate those fears. Then, go boldly forward. When you accomplish things that you think you can’t, your comfort zone will continue to expand. Even doing something seemingly small every day will lead you to something bigger. You will grow and begin to feel unstoppable. Just take that first step. Be mindful of your body language. Stand and sit up tall. Walk and move with purpose. It makes a world of difference. Walking slouched with our heads down makes us feel low and sends out a negative impression to the people around you. Watch for folded arms and slouched posture, and for fidgeting with your hands. Smile and make eye contact. What happened in your past is not an indicator of what will happen in the future. Constantly dwelling on past mistakes will hinder your progress. So, it’s important to forgive yourself and others and move forward along your path toward success.